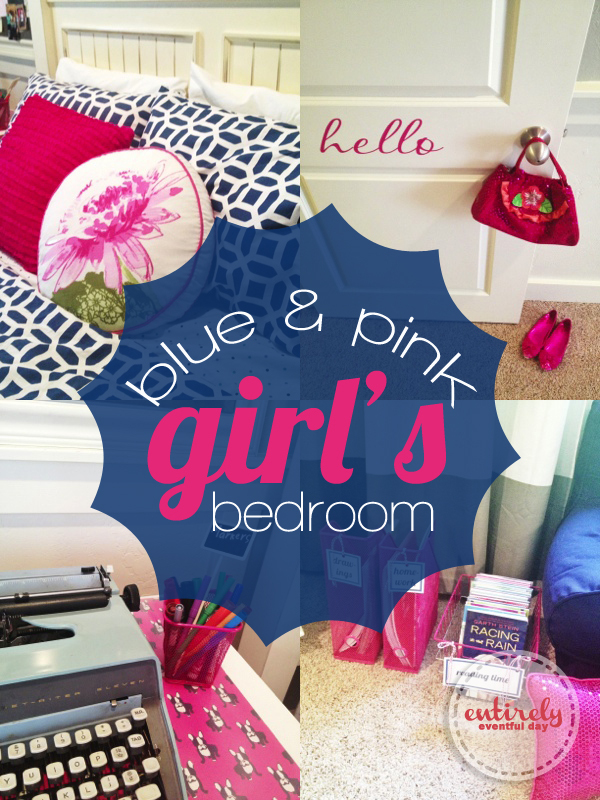 My daughter's blue and pink bedroom is finally finished! Are you as excited as I am? Because I am really excited relieved!!! 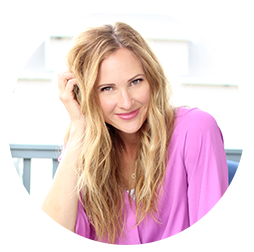 Oh, and some of my previous projects are featured in this room reveil, like my ever-so-popular custom desk pad and my gold-rimmed basket. Come on! Are you ready for the grand tour? 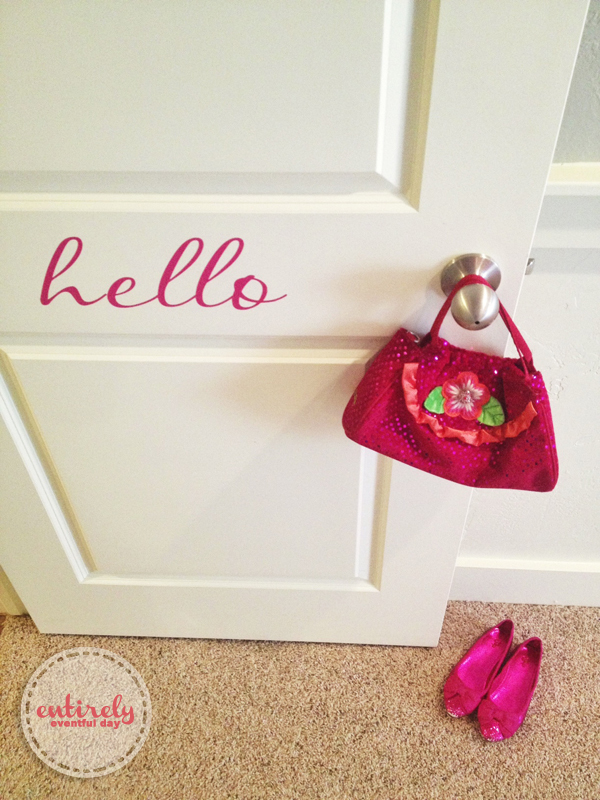 My little girl just adores this pink "hello" vinyl on her bedroom door. She also adores sparkly purses and shoes... but who doesn't? 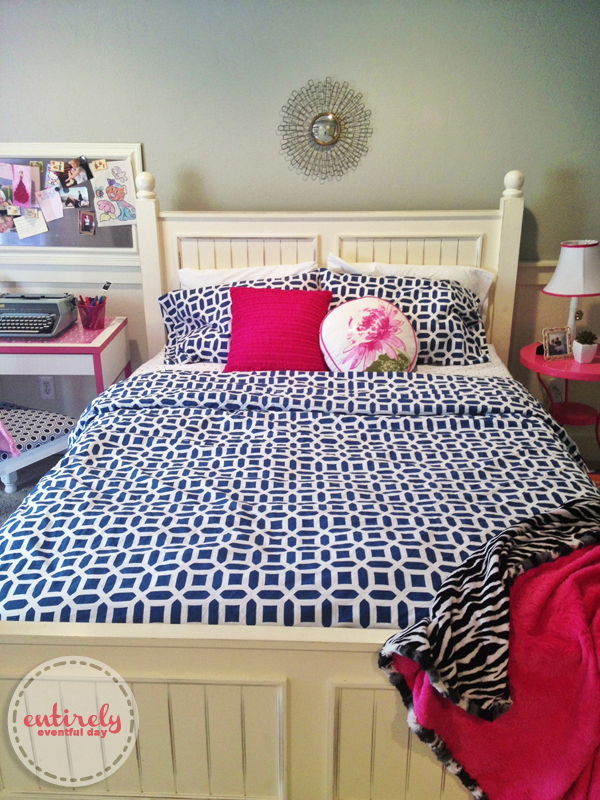 I am super crazy in love with this geometric duvet from Pottery Barn Teen (not an advertisement). I looked for less expensive alternatives at places like TJ Maxx but I just HAD to have this one! I did save on the pink ruffle pillow from Target and I just found the pink floral pillow at my mom's house (kinda a decor hoarder) and she let me have it (score!). The zebra and pink minky blanket was a handmade Christmas gift from Grandma. 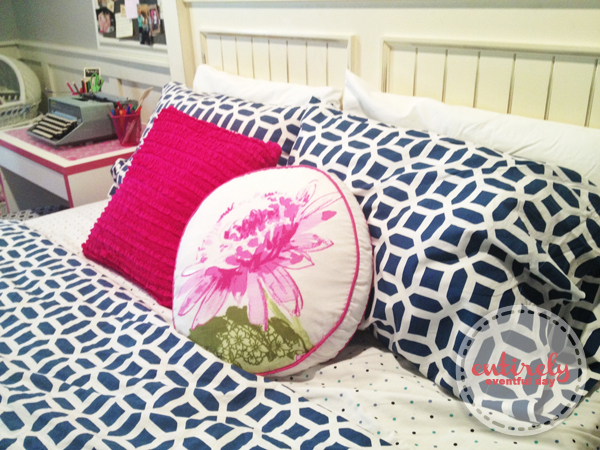 I grabbed some polka dotted sheets from Wal-Mart (just call me super saver) and some white pillow cases from TJ Maxx. This is her cute little bedside table. I think it's adorable that she loves to keep our weeding photo by her bed. She turns it face down when she's mad at us (dramatic much?). I got this lamp years ago at Traget and spray painted the little flower gold. 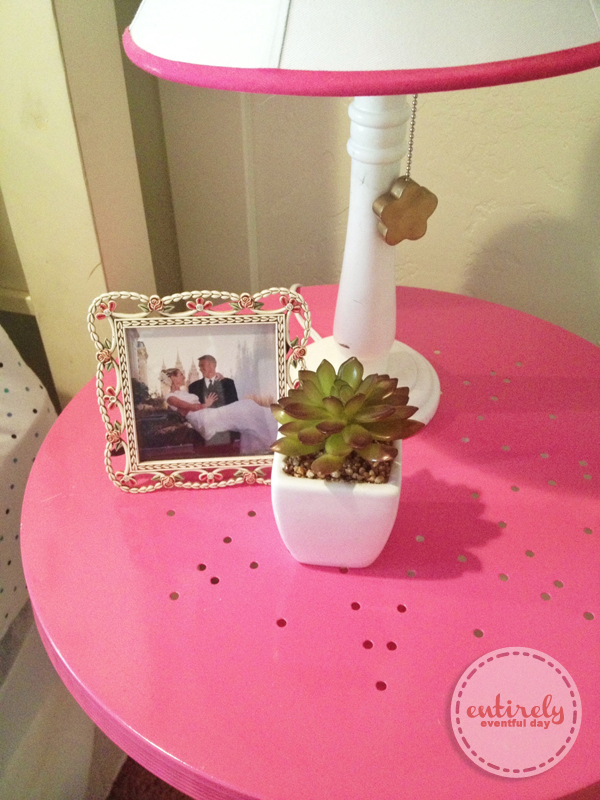 The table is from IKEA and I spray painted it pink. It doesn't look like IKEA carries that table anymore but this one is similar. The faux succulent is from Hobby Lobby. This has to be my favorite shot of the room! 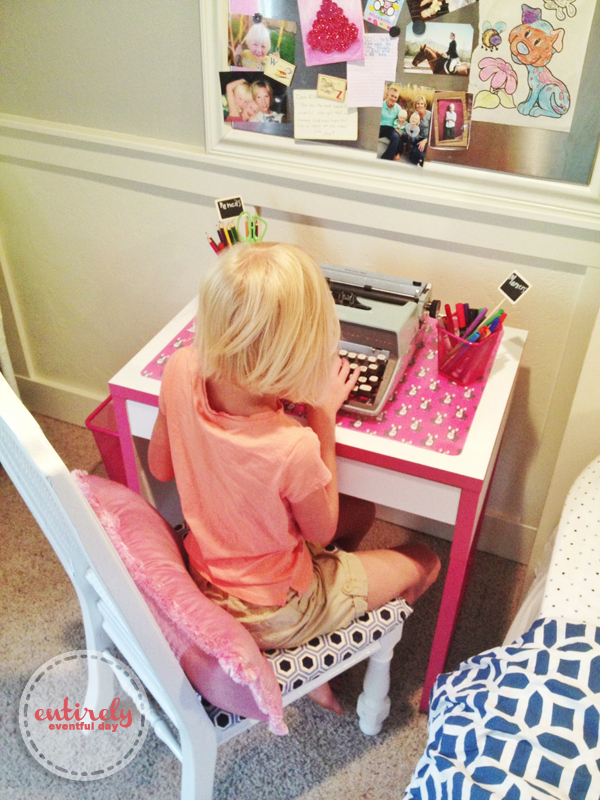 Do you spy the wainscoting? Yep, installed that myself! I would like to thank my husband for giving me a air compresser and a set of nail guns for my birthday. I was ticked at first, but now I'm happy as a little bird. The paint color is Mindful Gray by Sherwinn Williams and the trim is Almond White by Kwal. 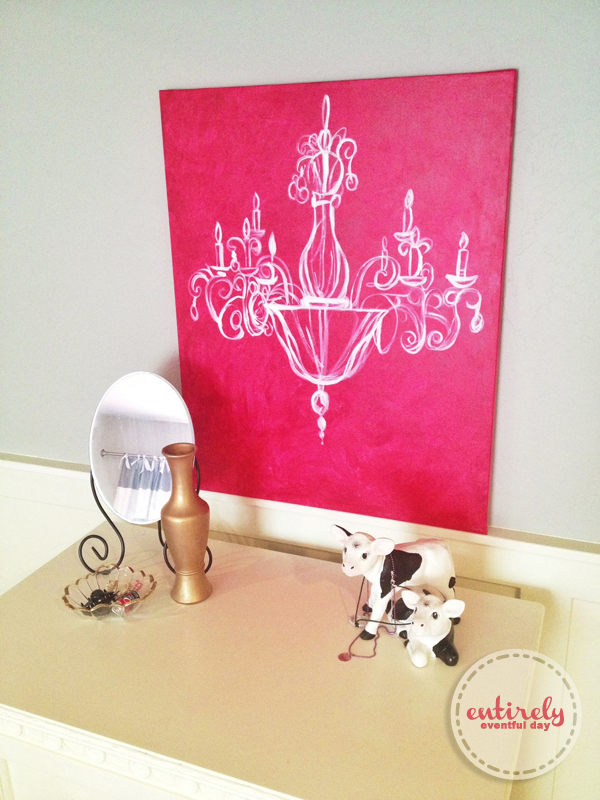 PS I super recommend the Cashmere paint by Sherwinn (it's the bomb!). I got these silly cows at the thrift store and was planning on covering them in moss but my daughter fell in love with them. The golden vessel was another thrifted find that I covered in gold Rub n' Buff (love that stuff). I took it as a sign that I was raising her right. It just so happened that her grandpa had one in storage. Now I just have to figure out how and where to get the ribbon changed so it actually works. But isn't it adorable? I got the mesh-wire organizers at IKEA and used some cute chalkboards-on-a-stick that I happend to have (from Pick Your Plum) to add some cuteness! 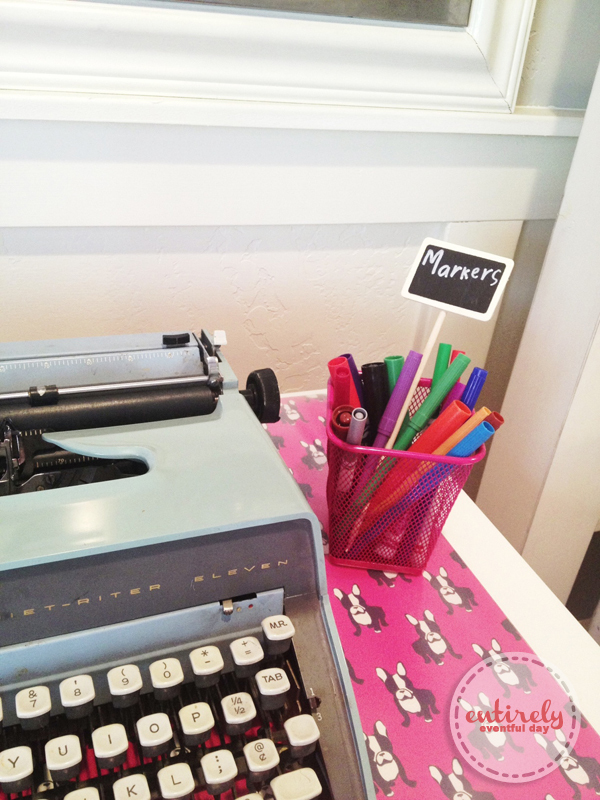 You might recognize my totally famous (ok, maybe that's a slight exaggeration) Custom Desk Pad! Go ahead, make one, it's so easy! 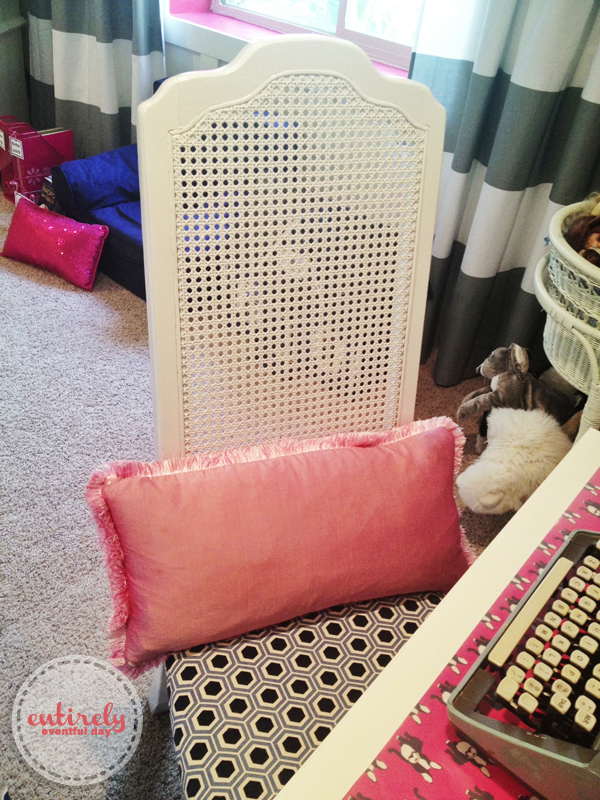 This chair was a piece of junk sitting at the thrift store when I found it... now look at it. 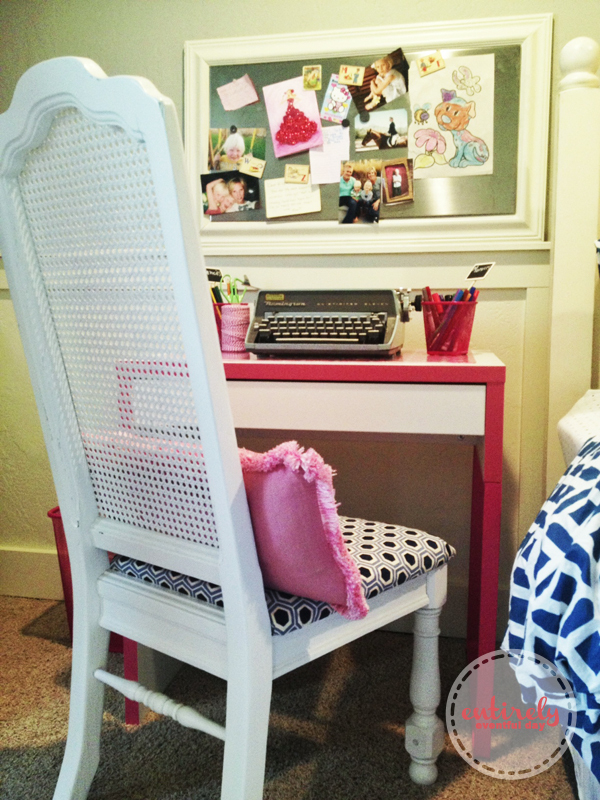 There isn't a problem that a coat of white glossy spray paint and some designer fabric (Calico Corners) can't solve! I made this magnetic dry erase board a couple years ago (sorry no tutorial). I found the metal dry erase board at IKEA (I'm actually not sure if this is the exact one I used) and built a frame, much like how I built this custom frame. 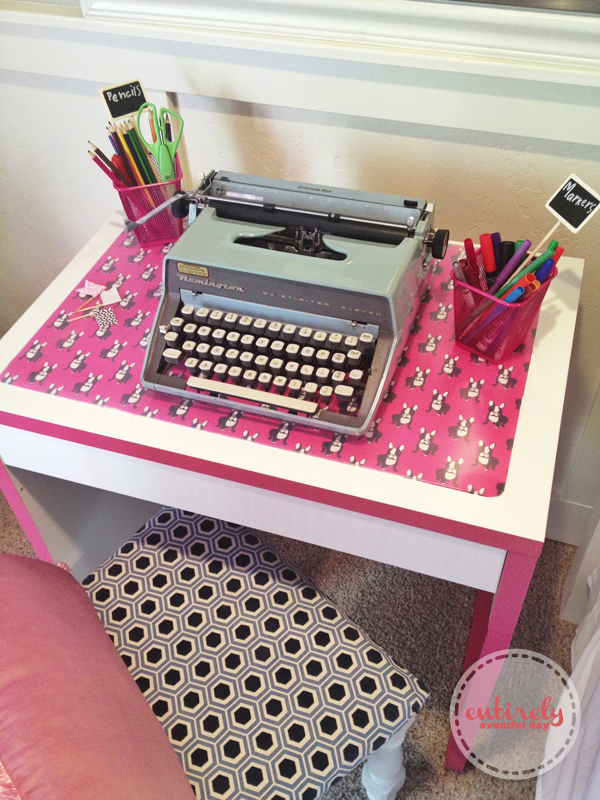 The cute pink and white kid's desk is from IKEA and only cost about $50!!! You guys, theres are SHOWER CURTAINS! I totally used these shower curtains from West Elm as window treatments and it's the best decision I ever made! 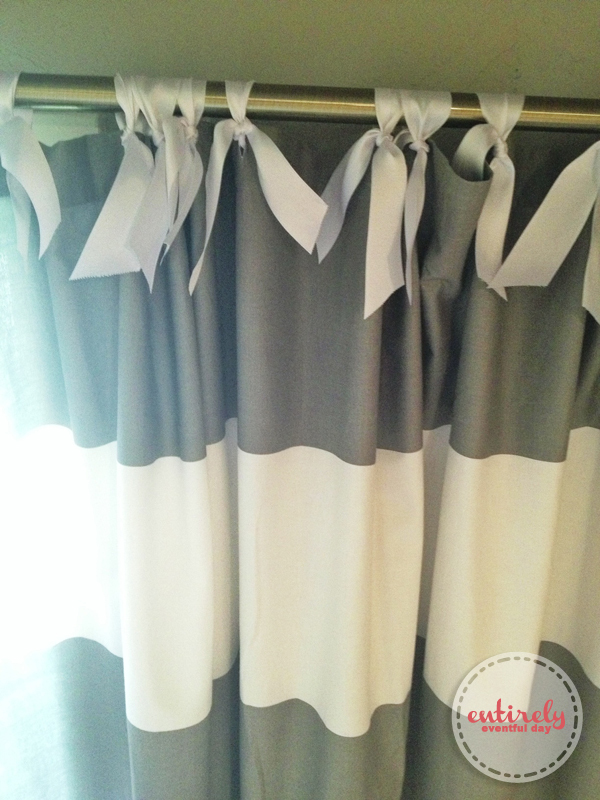 I had to have white and gray stripes and you guys know how expensive window treatments can be! I feel like it was destiny! This is a basement bedroom and so the ceilings are low so it won't work in every room, but in this situation it was PERFECT (que angels singing). AND I used white grosgrain ribbon to attach them to this cute gold rod I found at Target. Tada! 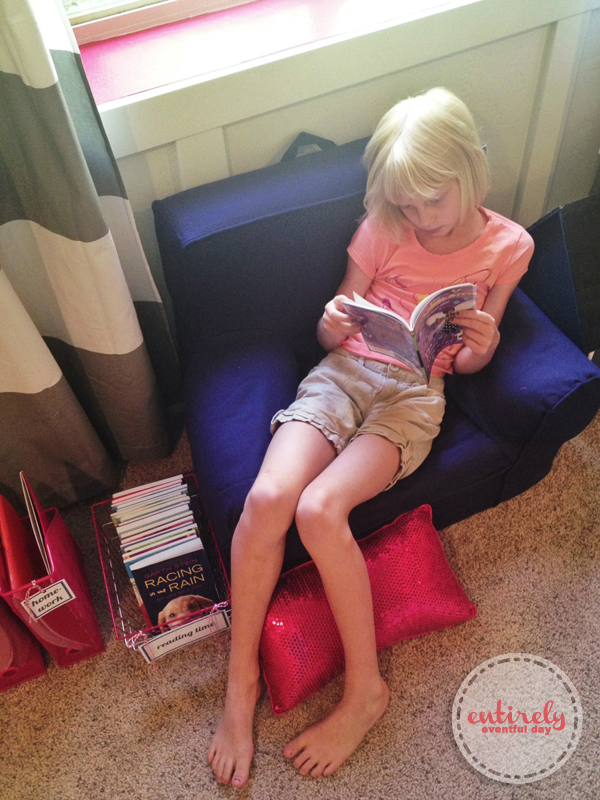 My little one (not so little anymore) simply adores her space! Oh, I almost forgot! I painted the inside of her window seal Berry Blush. I did it on a whim and grabbed one of those paint samples at Lowes. I was scared at first but then I remembered... THE DESIGN CHOICES THAT SCARE ME A LITTLE AT FIRST ALMOST ALWAYS END UP BEING MY FAVORITE! 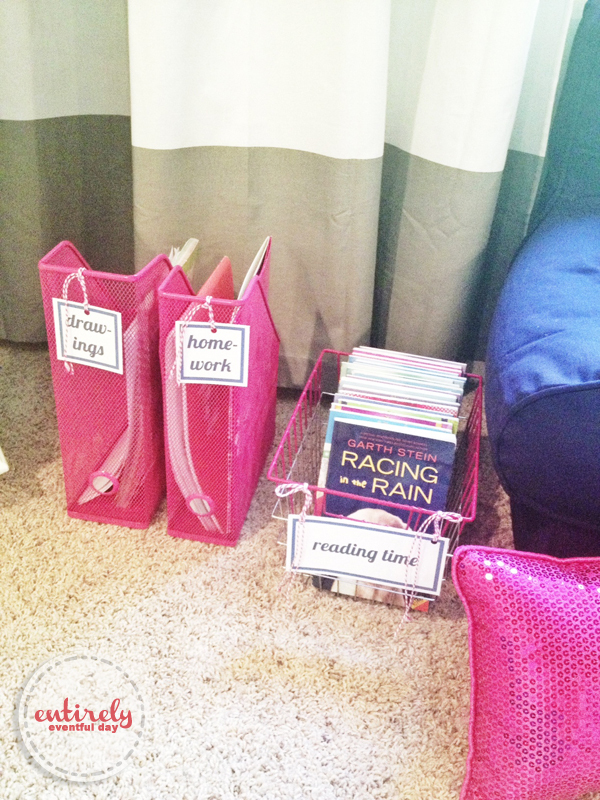 What do you think of the pink window seal? What do you think of the whole room for that matter? 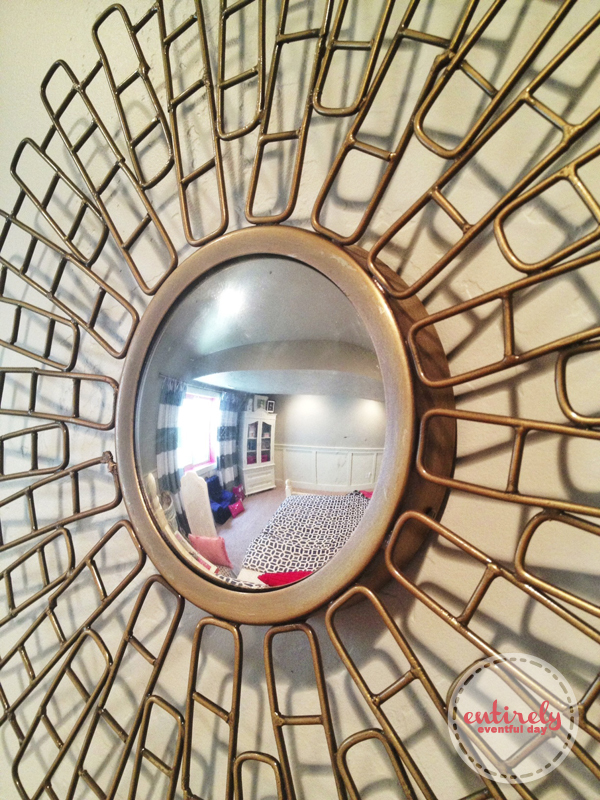 Here are a few items that I think would also look great in this room!